A playground is a large investment for any organization. There may come a time when you decide to relocate and you do not want to leave your playground behind. 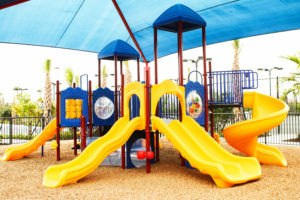 Pro playgrounds is one of the only companies in the United States to offer playground relocation services. Moving and re-installing a playground is much more difficult than installing a new playground from scratch. Special care must be taken to catalog every piece of equipment and hardware, making sure not to lose anything. Also, the playground must be installed exactly as it was before, down to the position of every bolt and screw. This is a difficult task to complete and can only be left to experienced professional playground installers. During the playground relocation process, it is common to have playground components break, regardless of how careful you are. Pro Playgrounds has built relationships with virtually every playground manufacture, allowing us to quickly order replacement parts. Complete removal of existing playground equipment. Cataloging and inventory of all playground equipment, parts and their condition. Labeling and bagging of all of the playground parts and hardware. Packaging and preparing the equipment for transport. Storing the equipment if necessary. Transport and re-installation of the equipment at the new site. Far too often we hear from clients that hired an inexperienced person or company to relocate their playground equipment, although the stories are different, the endings are always the same. The client ends up with equipment that is installed incorrectly, with damaged or missing parts, in need of a qualified company to come fix the previous companies mistakes, usually costing them far more than expected. Don’t make the same mistake, call Pro Playgrounds to move or relocate your playground equipment.